Blood, sweat, and tears all for a simple purpose, find an effective treatment and cure for Alzheimer's disease. Alan Arnette is a man on a mission. His goals raise $1,000,000 for Alzheimer's research and raise awareness. The say, you can't talk the talk, unless you walk the walk. In other words, actions speak louder than words. I could go on and on about Alan and his efforts. Instead, today, I would like you to listen to this 45 seconds of audio that Alan recorded from the summit of Mt Everest. Listen all the way through to the end, hold on tight. Alan cannot accomplish his mission of raising $1,000,000 for Alzheimer's Research alone. He needs our help, and the help of anyone you might know that is interesting in donating to help find an effective treatment and cure for Alzheimer's. 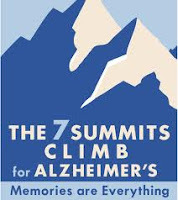 Please know, when you donate to this cause, you are donating to the Cure Alzheimer's Fund (CAF). One hundred percent of your donation goes directly to Alzheimer's research. Not 70 percent, not 72 percent, 100 percent.